In the world of joint use, reasons to take important tasks related to field asset management outside the organization vary, from resource contention to extreme circumstances that make large-scale maintenance or equipment replacement necessary. Let's explore the pros and cons of each option. Keeping tasks related to field asset management in-house, whether by shuffling staff around or via additional hiring, gives an organization the most control over work being done. Internal teams are simply closer to home with no middleman between you and the provider. When employees inside the organization who already have a grasp of proprietary knowledge and process complete tasks, the company loses less time in training. Employees who are already up to speed can get working more quickly and work with less oversight. Often, when field asset management tasks such as attachment requests and or tasks related to contract execution become overwhelming, organizations will tap any available staff to perform joint use functions. Removed from "business as usual," employees may become discouraged or be forced to neglect their everyday duties, creating deficiencies in other areas of the business. Outsourcing means you benefit from the help of a provider with highly specialized joint use management skills. Rather than dealing with new hire training or lack of focus after repositioning staff within the organization, the job can simply be done right and right now. Pressing backlog or overload issues that might drive a company to consider outsourcing are temporary situations. Hiring to fill a short-term need can leave businesses with underutilized staff when the workload normalizes. 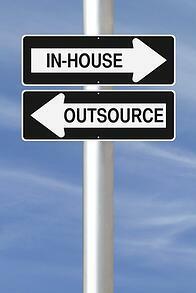 Outsourcing provides pinpoint service—only what you need, for only as long as you need it. This is a pro inside of a con. While engaging a third-party to help with joint use tasks would incur a one-time price, the savings in the long term can be significant. Do the job efficiently and effectively the first time and it is done. Reposition internal resources to do it incrementally, on the side of their other work and potential issues may have the time to become full-blown problems—and expenses. Working with internal resources assures a company knows what it is getting. Vetting a partner can take time and resources itself and a bad fit can cause more problems than solutions. When choosing to outsource, it's necessary to find a good fit. Fortunately, when the hours get long and the work demands more than your staff has to give, in the world of joint use you have options when it comes to hiring an independent entity to assist or take over field asset management. Engaging an experienced Joint Use Third Party Administration Service Provider (TPA) can be a smart move for organizations who lack the time or staff to manage mounting attachment or transfer requests, keep up with partner communication, while chasing down unauthorized attachers. Read how one Alden client used TPA services to solve its backlog issues and rise above the day-to-day resource contention that can come with business as usual tasks in the case study below.